Rather than type my usual lengthy diatribe, I’ll let the pictures do most of the talking. We spent the better part of Friday kayaking in the Pictured Rocks National Lakeshore with Northern Waters Kayak Rentals, then some photo ops at the Miners Falls, Munising Falls, and Laughing Whitefish Falls. Check out our hair-raising experience at Laughing Whitefish Falls HERE. Dinner at the Dog Patch in Munising – an interesting little pub’n’grub in a town with very few culinary options. They got a good Yelp and TripAdvisor review from us for decent prices, good burgers, and fast, friendly service. Another interesting catch was the sandhill cranes on the side of the road driving home. I had seen these huge birds before, but I wasn’t sure exactly what they were or where to find the info on them. I stumbled across a site called WhatBird.com that was able to provide all the details, and their “bird finder” application is awesome for figuring out what’s what. We drove into Marquette on Saturday to do our provisioning, and decided to take the time to have lunch in the city marina and enjoy the view while we were there. After the mandatory Starbucks (the only Starbucks in the entire Upper Peninsula! 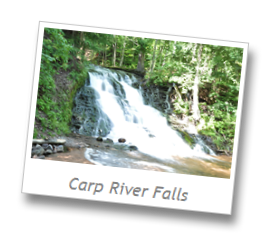 ), we headed to Carp River Falls for a quick hike and of course – more photos! Carp River Falls is only a few miles south of town, but the narrow dirt road to get there is obviously not maintained by the Marquette County Road Commission! There were more than a few spots where a 4-wheel drive truck would have been the proper tool for the job, but we made do with what we had available, and the Honda escaped unscathed. A very nice little set of falls hidden away in a heavily wooded forest with lots of elevation changes. Great hiking, and gorgeous views. What we both noticed was how spongy the centuries of fallen pine needles made the ground – it’s like walking on a workout mat. Very cool, and very nice on the legs and feet. 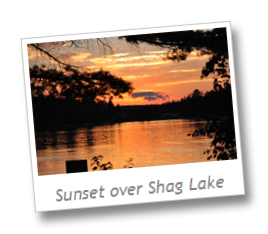 Another gorgeous sunset over Shag Lake. We discovered the DNR boat launch site on the east side of the lake makes the perfect sunset spot, so we get to have the best of both worlds – sunrises AND sunsets!